The Peninsula Paris takes Parisian luxury to a new level by delivering the impeccable service and accommodations with which the Peninsula brand has become synonymous. Spending more than four years and $580 million dollars, Peninsula Hotels and Resorts meticulously restored a Haussmannian-style building, with a dedication to highlighting its historic beauty coupled with a commitment to top-notch modern comforts. Even though the building epitomizes grand Parisian architecture, the decor creates an airy and updated atmosphere. What differentiates the Peninsula across the board is that no detail is overlooked. With 200 rooms and 600 employees, there is always someone available to attend to any and all guest needs, often before you even know you have them. The attention to detail extends to all areas: the restoration, design, technology, service, and cuisine, all of which come together to create a perfect guest experience. One could expect the Peninsula Hotel’s first property in Europe to be nothing less than spectacular … and that it certainly is! The Peninsula Paris is centrally located on the tree-lined Rue Kleber, just a block away from the Arc de Triomphe in the 16th arrondissement. If you are not in the mood for a walk, they have a fleet of customized cars, including Rolls-Royces, BMWs, Minis, and a Citroen — all equipped with WIFI, of course — to zip guests around in style. For the more adventurous, there is a Velib bike rental stand across the street. Space is one of the greatest luxuries in Paris, and the guest rooms at The Peninsula Paris are very large by Parisian standards (600 square feet for a Grand Premier Suite). Our room had a beautiful dressing room with leather drawers and a makeup area complete with a nail dryer. The beds are a delight— the ultimate linen perfection! Also, the Peninsula design team added extra soundproofing to make sure that the bustle of the city stops at the door. Rooms are extremely quiet. Bathrooms are striking, outfitted with floor-to-ceiling marble and spa tubs, a TV, a separate rainfall shower, and Japanese toilets. Everything is done in gray and cream tones that are a calm respite from the opulence of the city. In designing the hotel, the team thought of all the things that make life easier away from home and put them into the hotel experience. Small details like well-placed, multi-size plugs, a printer tucked away in the desk, a Nespresso coffee station and a lovely tea setup made our stay more comfortable. The mini-bar is stocked with complimentary snacks and drinks. As for the room technology, everything is controlled with the touch of a tablet, from the lights and temperature to the retractable window awnings. It is hard to remember that you are in a historic building when everything is so high-tech. There are plenty of dining options both in and around the hotel. Our favorite was lunch on the rooftop overlooking the Eiffel Tower at the gourmet restaurant L’Oiseau Blanc. The Peninsula is also known for its lovely afternoon tea, and in addition to the rooftop, has one of the largest terraces in Paris, right on Rue Kleber. At the end of a day of sightseeing, the 19,000-square-foot spa is the perfect treat. There’s an indoor pool with hot tubs, a soothing hammam, and a multitude of ESPA services offered. Families can get 50% off an adjoining room for children under 12 years old. Kids also eat free off the kids’ menu when they dine with their parents. Peninsula Academy offers unique but pricey activities, such as chocolate making, a fantasy football experience and a day at the Opera. The spacious rooms, indoor pool and friendly service make this hotel perfect for children. Peninsula Hotels has entered the European market with a tasteful grace that will make The Peninsula Paris the place to stay. Want Help Planning a Trip to Paris with Kids? CB! Vacation Consultants specialize in helping families book travel vacations in France, and Paris is our specialty. 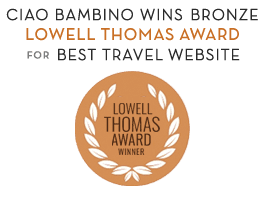 Our expert consultants do everything from recommending and booking accommodations (including a qualified options not featured on Ciao Bambino) to developing comprehensive multi-stop itineraries that include activities and vetted guides. For more information and to request assistance, go to the CB! Vacation Consultants page. Editor’s Note: Ciao Bambino received a media rate in order to review The Peninsula Paris. As always, our opinions are our own. Photos by Nancy Solomon except where noted.